Yellow swimsuits are super fun. I think this one with the knot detailing is extra fancy, too. Wearing yellow as a swimsuit is just so unexpected. Normally, black or even pink suits are appropriate colors for summer bikinis. However, if you feel bold enough, don one of these vibrant yellow suits to truly stand out while chilling by the ocean! I'm all over the scallop trend for swimwear right now...this baby blue top from Nordstrom is super adorable! Forever 21 has been on-point with the one-piece suits lately! I'm crazy for this lemon-printed one (under $30) and this floral cut-out, too ($25). If you purchase one thing for summer this year, make it a one-piece suit. They are SO in style right now and are extremely flattering for any body shape and size. 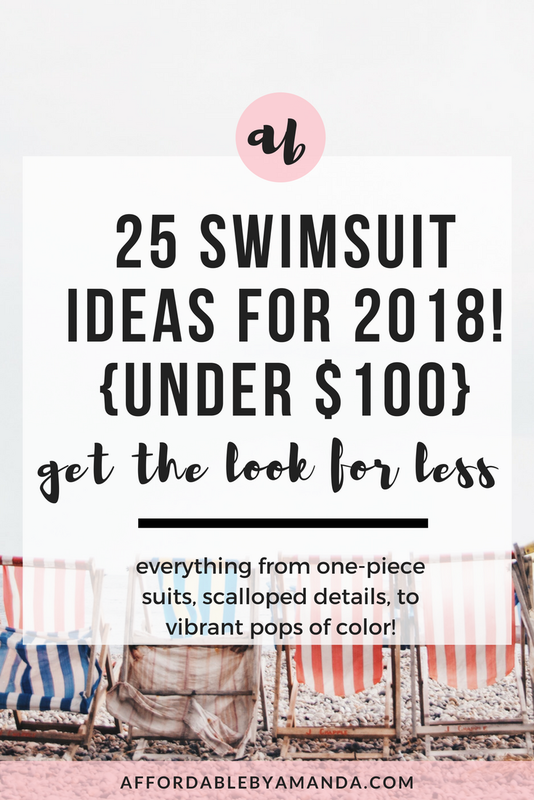 I absolutely love that one-piece suits are back as a top trend for 2018 because they are simple enough to throw on right before heading out on vacation. Check out the cute options found at Forever 21 if you are not willing to spend more than $100 on a one-piece, which I totally understand!! Most suits at Forever 21 are under $30, too. Talk about affordable! Bardot bikinis are all the rage! This one from ASOS can be yours for under $30. If you have a larger bust, these bardot style bikinis are seriously wonderful. They provide you with tons of extra support to be as comfortable as possible while lounging by the pool or escaping to the beach. Knot tie-front bikini tops are also super fun for summer. I love this one from TopShop in white or this one from Revolve in a vibrant green tone! I just can't get away from stripes, especially in the summertime. I think a striped one-piece can bring some serious cool girl vibes to your beach vacay with friends. Be on-trend with this one-piece sold at GAP for under $40!! This last widget contains tons of vibrant suits...I'm all about a pop of color this year. Adding some flirty scalloped details on this halter bikini set from SheIn is also a wonderful look to recreate to beat the summer heat! SHOP ALL OF THE BEST SWIM FOR UNDER $100!